During the initial walk through of the first building I had spotted a place that I recognized from online. Little Barn. It had a sign up saying 10% off if you paid with a check. Am I going to argue with 10% off? 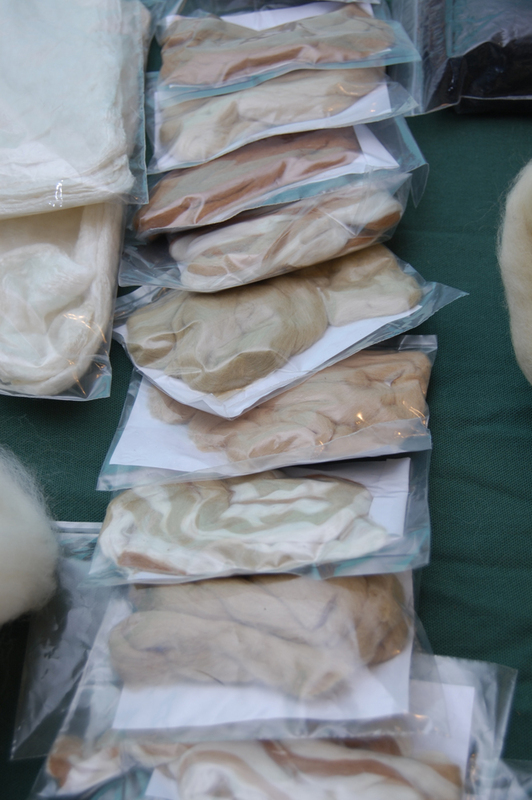 There wasn’t a lot of gorgeous fiber, but there was a good variety and some really nice stuff. Like this blend. I’m working on spinning this right now, along with some black Angelina that I got there. 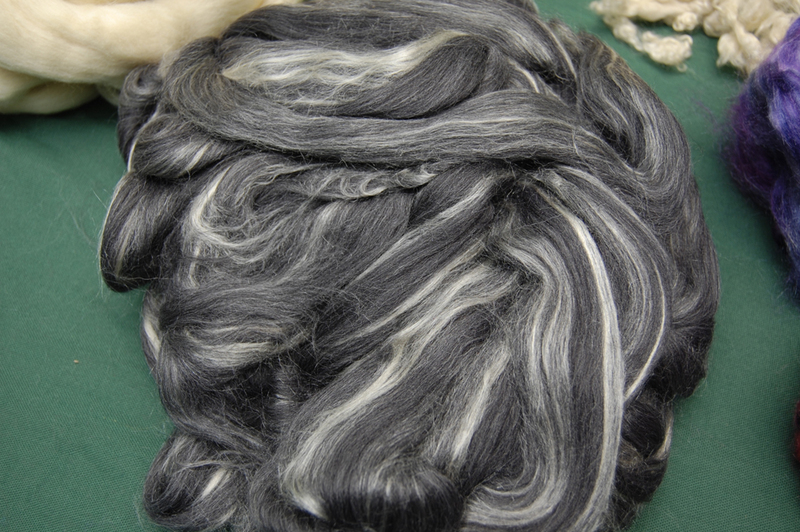 Angelina is little bits of sparkly stuff that you can spin or card into your fiber. The wool/silk drafts like a dream. 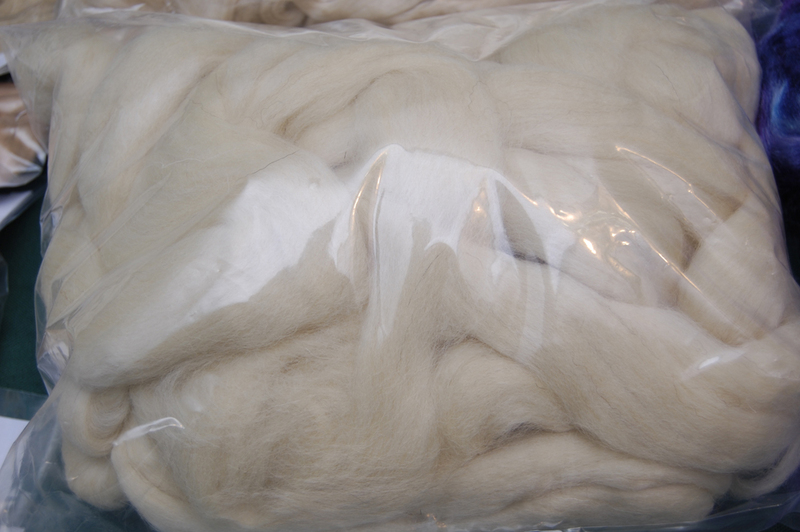 And then they had a nice little package of natural wool roving. I thought it would work well for dyeing purposes. It’s not as nice and soft as some of the other things I got, but it’ll do. Once I had collected my stuff (the above mentioned items and some white Angelina) I headed for the checkout counter, only to see this. 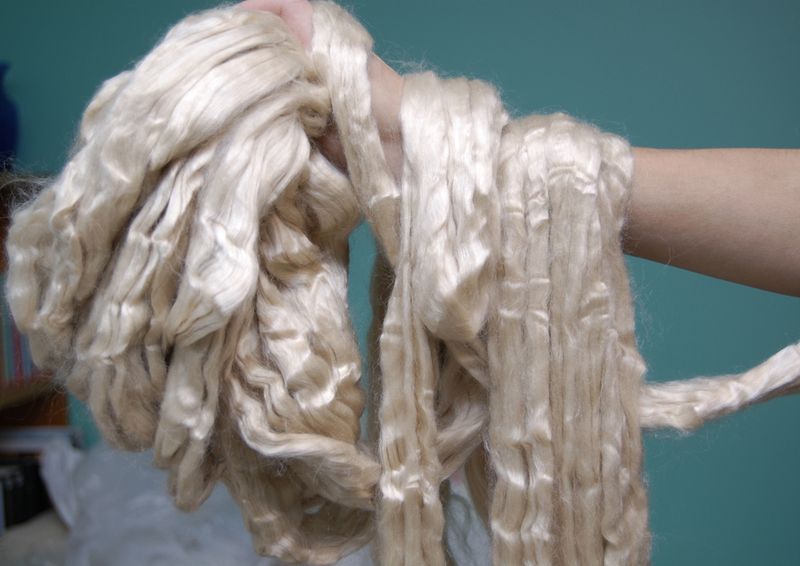 It’s unbleached Tussah silk roving. 8 ounces for $13. It was a show special price. I can’t wait to spin it! I’d read that silk is cob-webby, but it’s hard to grasp exactly what is meant by that until you hold some. Little bitty filaments grab onto any and every rough spot on your hand. I may have to use some moisturizer before I spin! Then, when the gentleman was ringing my order up, I saw a $5 package of cotton samples. I’d wanted to try cotton on a tahkli spindle, so I thought it would make a nice beginner package. Thirteen different kinds or colors of cotton. Now all I need is a tahkli! A tahkli? I’ll look forward to seeing what that is. The computer seems to push the color to a greenish tint. It’s a black/white combination that spins up into a dark grey with streaks.